This article is about the NPR journalist. For the country music entertainment executive, see Scott Siman. For other people named Scott Simon, see Scott Simon (disambiguation). Scott Simon (born March 16, 1952) is an American journalist and the host of Weekend Edition Saturday on NPR. Simon was born in Chicago, Illinois, the son of comedian Ernie Simon and actress Patricia Lyons. He also had a sister who died at a young age. He grew up in major cities across the United States and Canada, including Chicago; New York City; San Francisco; Los Angeles; Montreal; Cleveland; and Washington, D.C.
Simon's father was Jewish and his mother was Irish Catholic. His father died when Scott was 16, and his mother later married former minor league baseball player Ralph G. Newman, an American Civil War scholar and author who ran the Abraham Lincoln Bookshop in Chicago. Simon graduated from Nicholas Senn High School in 1970. Simon has been with NPR for over three decades, beginning in 1977 as Chicago bureau chief, and his career encompasses other types of media as well. He has hosted the Saturday edition of Weekend Edition since its inception in 1985, with the exception of a brief period in 1992 and 1993 when Alex Chadwick hosted the show. His books include My Cubs: A Love Story (2017); Home and Away: Memoir of a Fan (2000); Jackie Robinson and the Integration of Baseball (2002); Baby, We Were Meant for Each Other: In Praise of Adoption (2010), about his experiences adopting two daughters; and the novels Pretty Birds (2005) and Windy City: A Novel of Politics (2008). 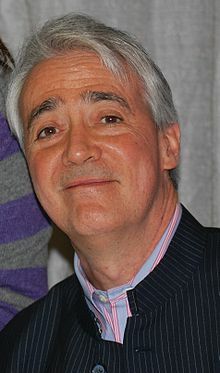 He has also hosted many television series and specials, including PBS's Need to Know in 2011–13. He guest-hosted BBC World News America, filling in for Matt Frei, and anchored NBC's Weekend Today in 1992–93. After September 11, 2001, Simon spoke and wrote in support of the "war on terror", publishing an op-ed in the October 11, 2001, Wall Street Journal titled "Even Pacifists Must Support This War." He questioned nonviolence at greater length in the Quaker publication Friends Journal in December 2001, provoking many angry letters, to which he replied in the May 2003 issue. On November 15, 2014, at the beginning of an interview for Weekend Edition Saturday, Bill Cosby and his wife Camille declined to respond to the accusations of sexual assault against Cosby when Simon gave them the opportunity. As narrated by Simon in the interview, Cosby only shook his head no. The rest of the interview focused on the couple's loan of their 62-piece African art collection for an exhibition in Washington, D.C.
On December 15, 2018, Simon opened on a story on the death of Jakelin Caal by saying, "I do not doubt that U.S. Customs and Border Protection agents did all they could to try to save the life of Jakelin Caal Maquin, a 7-year-old girl from Guatemala, who died in the custody of the United States." Journalist Jon Schwarz from The Intercept criticized Simon on Twitter. Simon has won every major award in broadcasting, including the Peabody and the Emmy, and has received numerous honorary degrees. In May 2010, he was awarded an Honorary Doctor of Humane Letters degree by Willamette University, where he was that year's commencement speaker. He was inducted as a Laureate of The Lincoln Academy of Illinois and awarded the Order of Lincoln (the State's highest honor) by the Governor of Illinois in 2016 in the area of Business, Industry & Communications. Simon met French documentary filmmaker Caroline Richard during an NPR interview in 2000. They married on September 10, 2000, in a mixed-faith (Methodist, Quaker, and Jewish) service in Ridgefield, Connecticut, at the home of fashion designer Alexander Julian. They have two daughters, both adopted as babies from China: Elise, in 2004, and Lina, in 2007. They consider themselves a Jewish family (Simon's father was Jewish and his mother was Irish Catholic). In 2006 Simon and his wife were contacted by police as part of the Alexander Litvinenko poisoning investigation. The family was staying at a hotel near the restaurant at the center of the poisoning incident, and had twice bought food there for their daughter Elise. The health of the family was not affected. In July 2013, in a groundbreaking use of social media, Simon began tweeting his emotions and conversations with his mother during her last days of life, which she spent in a hospital intensive-care unit. "I just realized: she once had to let me go into the big wide world. Now I have to let her go the same way", read one tweet. In March 2015, he published a memoir about her titled Unforgettable: A Son, a Mother, and the Lessons of a Lifetime. He is the nephew of Jack Brickhouse. ^ a b Lois Smith Brady (September 10, 2000). "Weddings: Vows; Scott Simon and Caroline Richard". The New York Times. Retrieved February 23, 2008. ^ "Annoying Campaign Songs". Weekend Edition Saturday. February 23, 2008. National Public Radio. Audio. Retrieved February 23, 2008. ^ Susan Van Dongen (November 14, 2000). "Three Americans: Abraham Lincoln, Aaron Copland and NPR's Scott Simon". The Princeton Packet. Retrieved February 23, 2008. ^ a b NPR Biography on Scott Simon. Retrieved October 9, 2012. ^ Simon – Family Pictures. Retrieved October 9, 2012. ^ Paula Davenport (October 26, 2008). "Simon Says". The Spokesman-Review. ^ Terry Gross (August 23, 2010). "Scott Simon's Family: 'In Praise of Adoption'". Fresh Air. ^ a b c Christine G.K. LaPado-Breglia (May 5, 2011). "NPR Host Scott Simon to Cover Every Beat for Chico Audience". Chico News. ^ Scott Simon (April 1, 2015). "'We Don't Fully Grow Up' Until We Lose Our Parents". Morning Edition. ^ Jonathan Alter (May 2000). "Chicago's Cubs". The Washington Monthly. Retrieved July 9, 2007. ^ "Books". Scott Simon Books=. Retrieved May 1, 2016. ^ a b "Biography: Scott Simon". NPR. Retrieved May 1, 2016. ^ Web copy made available by Ellen Comisso, retrieved January 16, 2010. The op-ed is cited and quoted in "When reporters sound off, eyebrows rise". Current. September 8, 2003. Retrieved January 16, 2010. ^ Scott Simon (December 1, 2001). "Reflections on the Events of September 11". Friends Journal. ^ Scott Simon (May 1, 2003). "To Friends Journal Readers: A Response". Friends Journal. ^ Scott Simon (November 15, 2014). "In NPR Interview, Bill Cosby Declines to Discuss Assault Allegations". Weekend Edition Saturday. ^ "Opinion: What The Death Of A 7-Year-Old Migrant Says About This Country". NPR.org. Retrieved December 17, 2018. ^ Schwarz, Jon (December 16, 2018). "In 2004 Scott Simon attacked Fahrenheit 9/11 for not investigating whether bombs that killed Iraqis during the invasion had come from US planes or were errant Iraqi anti-aircraft shells. As if there would have been anti-aircraft shells without the US war". @schwarz. Retrieved December 17, 2018. ^ "2010 Honorary Degrees", Honorary Doctor of Humane Letters & CLA Commencement Speaker, Willamette University. ^ Office of the Governor, State of Illinois (February 12, 2016). "Governor Rauner Announces Recipients of 2016 Order of Lincoln Award" (PDF). Lincoln Academy of Illinois. ^ Scott Simon (November 27, 2004). "Cat and Child, So Comfy Together". Weekend Edition. Retrieved July 10, 2007. ^ a b Jeff Rubin, "NPR Host Scott Simon: Riding on Airwaves", Hillel: The Foundation for Jewish Campus Life, October 18, 2006. Also at InterfaithFamily.com. Both retrieved July 10, 2007. ^ "Scott Simon Releases First Novel: Pretty Birds", WKAR, August 30, 2005. Retrieved July 10, 2007. ^ Scott Simon (June 30, 2007). "Reflections on Welcoming a New Family Member". Weekend Edition. Retrieved July 10, 2007. ^ Robert Siegel (November 30, 2006). "NPR Host's Lunch in London Intersects Spy Case". All Things Considered. Retrieved July 10, 2007. ^ Carlos Lozada (March 19, 2015). "Review of "Unforgettable: A Son, a Mother, and the Lessons of a Lifetime" by Scott Simon". The Washington Post. Retrieved June 29, 2015. ^ "The life of longtime Cubs player Ernie Banks". NPR.